Such an amendment was drafted as a bill in Russia for a meeting of the legislative committee on July 11. 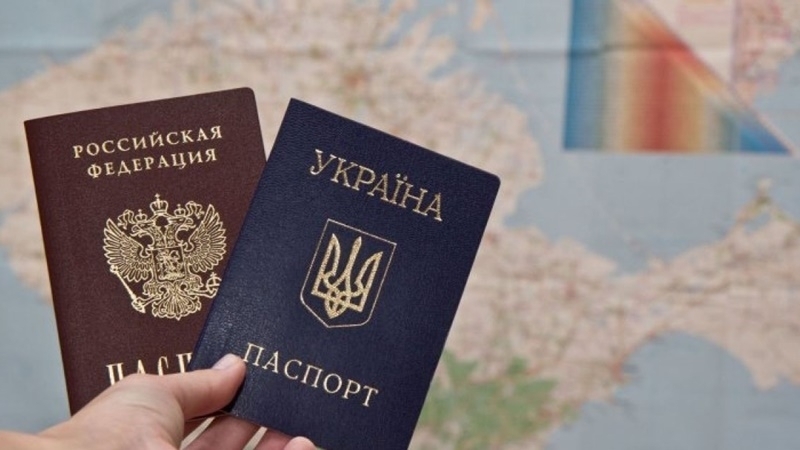 A bill proposed in the Russian Federation allowing Ukrainians to become citizens of the Russian Federation after a public repudiation of Ukrainian citizenship if they could not receive a certificate of renunciation, "Ukrainian Truth" informed citing Russian media. Reportedly, such an amendment was prepared for a meeting of the legislative committee on July 11. The amendment will be proposed to introduce into the bill, which will allow to revoke the citizenship of those convicted of terrorism and extremism. The State Duma plans to consider it in the second reading on July 12, on July 4th the lower house committee reviewed the revised text, which was supplemented with the law on taking an oath before entering the Russian citizenship. However, according to the Russian edition of Kommersant, on July 11, the bill may again be adjusted - in particular, to determine the moment when a new citizen of the Russian Federation will receive a passport: before, after or during the pronouncement of the oath. Furthermore, the Head of the legislative committee Pavel Krasheninnikov (United Russia) said that the representatives of the migration and legal departments of the Ministry of Internal Affairs of the Russian Federation will inform the committee about the situation with citizens of Ukraine who wish to receive citizenship of Russia, but can not receive a certificate of renunciation their citizenship of Ukraine for this purpose. According to him, the bill for such citizens will establish a procedure for "public renunciation of citizenship of Ukraine." Initially it was assumed that the necessary amendments to the bill on public refusal from the former citizenship could be made in the regulations of the Ministry of Internal Affairs, but law enforcers insist on the change of the law. The Vice-Speaker of the State Duma from the LDPR Igor Lebedev said that the issue was raised in the Duma on the July 6, after the proposal of the leader of the Liberal Democratic Party of Russia Vladimir Zhirinovsky to President Vladimir Putin "to exclude the certificate of renouncing the citizenship of that country" to which the person belongs, if the person is unable to get it. Speaker of the lower house Vyacheslav Volodin then spoke about the inhabitants of the occupied Crimea and Sevastopol, who allegedly still experience "difficulty in obtaining Russian citizenship." The President of the "Migration XXI Century" Foundation, former Deputy Head of the Federal Migration Service Vyacheslav Postavnin said that "the situation is not very legal": "What does it mean to publicly renounce another citizenship? One said today, and another said tomorrow." Reportedly, the bill of Konstantin Zatulin, a propagandist and ideologue of the "Russian world", who proposed to grant Russian citizenship to "Russian-speakers resettled in Russia", would not be adopted.